It only took me 8 months but I finally decided that I might actually have a use for AirPods, so last month and went ahead and bought a pair. For those of you that don't know what AirPods are, they are the funny little wireless/Bluetooth headphones that look like somebody just clipped the white wires off of Apple's stock wired headphones (which are called EarPods...confusing right). Apple released the AirPods in December of 2016 and they have been in high demand and limited stock ever since. When I ordered my online last month I still had a 6-week wait but I was able to find a pair within a few weeks at a local Apple Store so I cancelled my online order. So what's the big deal about the AirPods? Initially I didn't think all that much, which is why I didn't get them right away. Up until Apple released the AirPods all Bluetooth headphones paired the same way with devices, and by that I mean manually. As long as you never use the headphone with more than one device then they might re-connect the next time you wanted to use them, but then again more often than not they wouldn't. The AirPods are different in that they pair instantly with all of your Apple devices that you are signed into with your iCloud account. So if you listen to some music on your iPad and then you pickup your iPhone to make a phone call all you need to do is select the AirPods as the audio source on your iPhone and they are connected (you don't have to go into the Bluetooth section of the settings app to re-pair them). As someone that is always switching from one device to antoher this is a huge conveinence. But it is even more of a selling point if you have an Apple Watch. Pairing a set pf Bluetooth headphones to my Apple Watch every time I wanted to go out for a walk or a run was a huge pain. Now with the AirPods it is two taps on my Apple Watch screen and I am off and running. Apple is able to do this becasue they built thier own custom chip (called the W1) into the AirPods that manages the connections with all of your devices. Apple has also started integrating this chip into some of thier Beats headphones too. The W1 chip is a new way to pair a device like the AirPods to a device like an iPhone over Bluetooth. The W1 chip does a couple of things for you as the end user. For one thing it makes pairing and then switching audio between devices seamless like I described above. In addition the W1 chip extends the range in which the Bluetooth connection is effective from about 30 feet now up to 150 feet (device dependent) all while reducing the amount of power required to maintain that connection. As far as wireless headphones goes the AirPods stack up pretty well when compared to all the others on the market. Sound quality is what you expect from a very small set of headphones but you do get a surprising amount of bass given the size. The overall quality of the sound is also quite good, much better (at least in my opinion) than the wired EarPods (Apple's standard wired headphones). I think some of that better sound quality is due to the better overall fit of the AirPods in my ears than the wired ear buds (EarPods). This one is a bit of a catch-22. The AirPods are quite small and therfore they have a very small battery capacity built into them. So while with larger headphones you may be able to get 6-8 hours or more of battery life, with the AirPods you will only get about 5 hours. The only reason I bring this up is because I have actually run into that 5 hour limitation within a single continious use where with other headphones I have not. But here is why this is not really such a bad thing. For one it means I was actually using my AirPods because they were so convienent and comfortable. Also, when I got the audible alert in my right ear (I was only wearing one AirPod at the time) all I had to due was pop the left AirPod in my left ear and put the nearly depleted right AirPod in the case to charge. The AirPods case also provides an additional 24 hours of charge and charging an AirPod from 0 to 100% only takes about 20 minutes. Having headphones that are compeltely wireless (not even tethered together) is very significant. Being able to just pop in a single earpiece and listen to some news, a podcast or some music while still being able to hear other things going on around you makes you much more likely to use these more and more. Speaking of using the AirPods more, ever since getting them I my backlog of unlistened to podcasts has shrunk to near zero (and after my massive summer of travel I had an incredibly large backlog of podcasts to listen to). I am now using AirPods to listen to podcasts at times and in places where I never did before because they are so convienent. If you have a car that doesn't have a good wireless or handfree setup for your iPhone, wearing a single AirPod is an excellent way to get a handsfree expereince to listen to audio (like a podcast) and take an occasional phone call. AirPods work really well in an office environment where you have to start and stop music constantly because of people coming into your office to talk to you. With other headphones I would have to take the headphones off from my head (the headband) and then seperately stop the audio. With AirPods all I have to do is pull a single AirPod out of my ear and the audio stops. When I put the AirPod back in the audio resumes. Seems like such a little thing but this makes them so much easier to use in a busy work environment. Sound isolation is ok but not great with these. They isolate just enough sound that they allow you to enjoy your music in a noisy office environment, but not good enough to block out noisy gym music if your gym plays music over a loud speaker (why do gyms still do this when everyone brings their own anyway). Looks...wearing AirPods does make you look a little geeky, but honestly if you are selecting your headphones based on how "cool" they make you look then you probably need more fashion help then headphones can provide. I personally think people wearing a huge set of Beats headphones look pretty silly but that seems to be in style so maybe I'm not a good judge of cool. So just be aware that AirPods probably won't win you any fashion points. If your ears are a good fit with AirPods then they really do stay put in your ears. I have gone running, done burpees and upside down yoga poses all without the AirPods moving. Surprisingly these things are very secure in your ears. But if the contours of your ears don't work well with AirPods then return them to Apple within the return timeframe and don't look back. It's not worth having headphones that don't fit well enough to give you good sound quality and stay in your ears. From what I have heard from people the AirPods either work really well with your ears or they don't, there is no in between. I miss having volume controls on my headphones and using voice commands to turn up or down the volume with Siri is a bit clumsy. But I have an Apple Watch so I can just turn the Digital Crown to control volume and that has worked really well. AirPods are very comfortable in your ears. They are extremely light-weight and I can wear them all day long without my ears getting sore. My ears hurt after wearing Apple's wired headphones for about 30-minutes so this is a HUGE comfort improvement. Both the individual AirPods and the case are quite slippery to the touch. Since they spend most of the time in your ears this isn't too big of a deal, but just be careful handling them in an environment where its not safe to drop them in. Same thing goes for the case, there is a pretty big drop potential so be careful. The case can also easily slip out of your pocket unnoticed which is why I rarely keep the case in my pocket. Overall I have been very happy with my AirPods. I am listening to music and podcasts more than I ever have and I have found the auto-pause feature when you take one of the AirPods out to be the most valuable feature for how I use them. I know there are better sounding wireless headphones out there but the combination of comfort and convenience makes AirPods a must have, especially when used in combination with the Apple Watch. If you have been on a "holy grail" like quest for the perfect pair of Bluetooth workout headphones like I have, then your quest may be over. I actually didn't buy them, they were a birthday gift in October of 2012 (but they were a suggestion to my benefactor). I also received the very generous gift of an iPad Nano (for more on why I wanted the Nano read my blog post about it) for my birthday that year (another item on my wish list that year). I wanted this combination of iPod Nano and wireless headphones so I could go to the gym and lift weights, go out running and go out on the road bike (don't worry I only have the right earbud in while out on the road) and not have to worry about exercising around a cord. I sweat...a lot...so getting something that was sweat/rain resistant was a MUST. I can't knock these headphones on the bluetooth connectivity because that is the compromise you are agreeing to when buying into bluetooth technology. If you are using something small like a iPod Nano then it works just fine if you put the Nano in your right front pocket of your running shorts. If you are out on a road bike then I have found that you can put your iPod or iPhone in the back right pocket of your jersey but you have to experiment with the orientation of the device . For my iPhone 5s it needs to be top pointed down and the screen facing outward and I get enough connectivity. The best way to do it though is to get an armband and put it on your right arm. I must have a deformed right ear. Every pair of headphones I have end up falling out of my right ear (maybe my head isn't on straight). I had a heck of a time getting the right combination of inserts to work for my freakish ears. 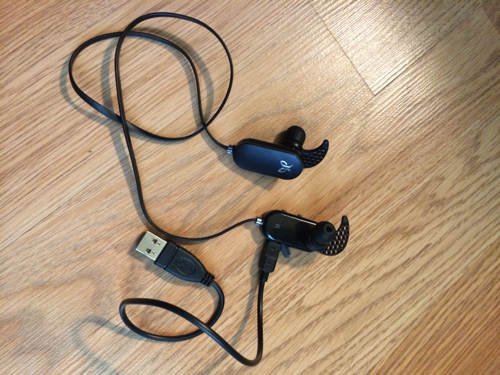 However, after much trial and error I was able to find the right combination of earbud tips and ear inserts to keep them in my ears while running. Running is the toughest use case for keeping them in your ears. All other activities (indoor/outdoor on the bike, lifting weights, elliptical trainer) seem to do just fine with these headphones but running requires you do have your act together when it comes to fit. I've found the if you make sure the ear inserts are rotated properly in the grooves of your ear and if you ensure that the earbuds are rotated so they are pointing as close to vertical as possible then they pretty much stay where they are supposed to. Just don't hesitate to spend some time switching out pieces and getting the right fit. It's worth the fiddling time to get the fit right. 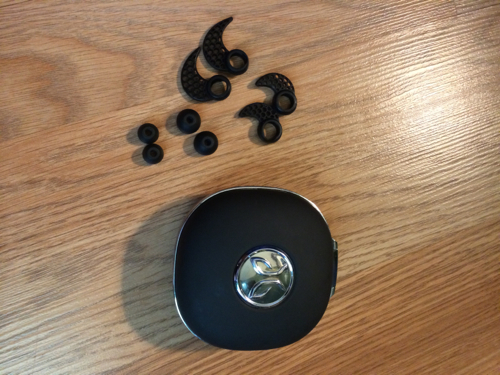 Jaybird has since come out with new versions of these headphones. Hopefully they have fixed the lack of low battery indication. The newer headphones are also lighter and have almost twice the battery of life compared to mine. I can honestly say that even with all of the negatives that I listed above and my rant about battery indication I really do love having these headphones. I workout quite a bit and bluetooth really does provide you an extra freedom while working out...the freedom to not worry about a pesky cord. While I can't personally recommend the newer version of these headphones because I haven't used them I can say that if Jaybird was able to make some minor improvements to these newer models then they are worth every penny. I've put my pair of headphones through hell and they are still working just like the day I got them and appear to have about the same battery life (no degradation in battery life). If you are an exercise junkie you will appreciate these and won't regret your purchase. There are a ton of options when it comes to headphones, and choosing from all of those options can be even more confusing when you intend to use the headphones on an airplane. I've tried a lot of different headphone options and I think I've found a really good and cost effective solution. So after 5 years of enjoying an all-in-one digital device I have broken down and gone "old school", and started using an iPod on a daily basis and I couldn't be happier. Sometimes having multiple devices for things really is the right way to go.